I participated in the training about gender roles, because I didn’t know enough about the subject. I expected to get to know more about the discrimination that women experience today in Hungary. Compared to this, I got a lot more, because the training enlightened a lot more things for me. For example the fact that I do not treat women as equal partners in many of my relationships. I realized that I, too, suffer as a man from the gender roles expected of me. It is better for me, too, if I don’t have to meet expectations just because I am a man, and it is better for me, too, if I don’t expect things from the other person just because I suppose what and how they should do. Instead, let’s talk with the other person – as we did in the training – and doing so, we can get better results as we work together. Before the training, I was excited about how it was going to think about questions of which my social group is the cause and the maintainer. But the presence of trainers, Móni and Mariann, was reinforcing all along. First of all, it was clear that they are familiar with the subject – the two days were super-informative. On the other hand, they never made me feel that I am the oppressor, instead, they listened openly when I expressed my opinion. I would recommend this training to everybody. Apart from the subject itself, one of the best things in the training was that I could meet people who I didn’t know before, and who I would happily meet again. We started out as strangers, but we got to know each other a little. I realized how narrow my world is, and how rarely I have the chance to think together with unknown people in such a calm and safe environment. It was super to meet so many kinds of people, who are out of my circle and experience that I can broaden the boundaries of my world by participating in such a training. 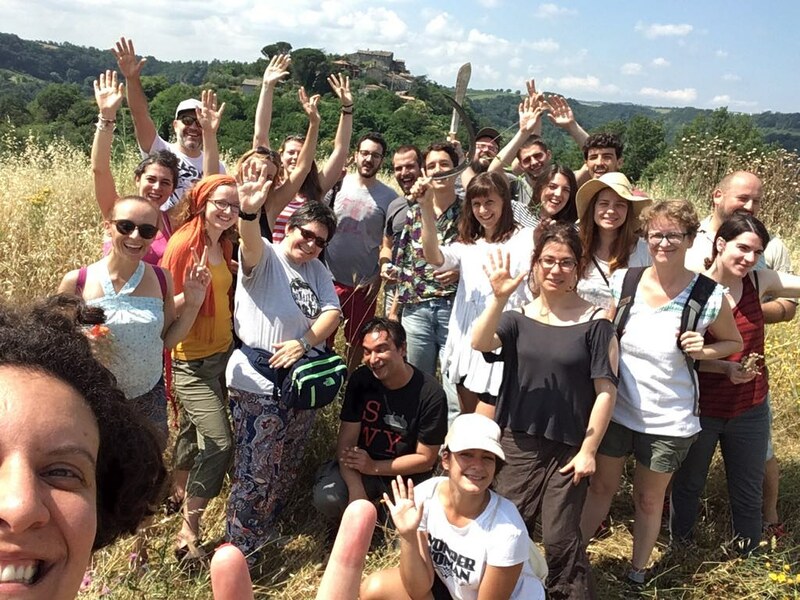 In June 2018, I had the chance to take part in an Erasmus + training course in Sermugnano (Italy), which dealt with the topic of gamification. The title may sound surprising. War games? What does this have to do with the School of Public Life? The title was inspired by an American sci-fi from 1983, in which an adolescent boy used his knowledge gained from computer games to stop an all-out nuclear war. The topic of the training was using the theory of game design and games themselves in our educational and youth work. For me the nine days I spent with teachers, youth workers and trainers from 20 different European countries were very useful and rich in experience. I had applied to this training because we have wanted to build gamification into the methods of the School of Public Life for a long time. Of course, I do not consider myself an expert as a result of this training, but did learn and understand a lot about this approach and I also had the experience of creating our own game. The location of the training was unique. We stayed in Sermugnano - a medieval village with a population of 60 people - in a building maintained by the training team in cooperation with the local municipality. The building used to be a school, but unfortunately there are no children in the village any more so it had to be closed. With the current utilization, however, both the building and youth activity have been preserved! An organic part of the training was “service & care”, which meant that every morning we spent one hour in small groups to maintain the building and its garden. We did cleaning, washing-up, gardening and other tasks related to the training (for example managing the Facebook page of the training and administrative tasks) in a rotating system. The context of the training was provided by the classic Dungeons and Dragons role playing game. On the first day, everyone had to create their own avatar based on the enhanced instructions of Dungeons and dragons. I will be honest: this was the first time I heard both about this game and the concept of an avatar as a basic element of game design. Also, already on the first day, we got the task of creating a one-page game - in any way we wanted about anything we wanted. At first this seemed a bit impossible, but then everyone managed to complete the task and we also played with each others' games, which was quite liberating. We dedicated a whole day to the methodology of LEGO serious play. This approach seems to have many creative elements and I could feel that there was potential in it to develop self-confidence and self-knowledge or even to develop common strategies, but I don't think we managed to fully understand how this method works and what it is was especially good for. In any case, it was an important lesson that playing with LEGO is in itself a source of joy for most people. As it turned out, for most participants LEGO was among their favorite games as a kid - and for many, it still is. This is when I also realized that I was a serious LEGO builder when I was a kid and that I could use this passion today as an adult as well in both my free time and educational or activist work. The training did not promote one specific political philosophy, which would have been impossible due to the participants' diverse backgrounds and fields of interests. There were museum employees, youth workers, union activists and university teachers among the participants, who all wanted to apply their new knowledge in very different fields. At the same time, it was important to me that we spent a whole morning discussing the dominant values in European societies as well as the values that are important to us personally and professionally. In order to do this, we used the theory of basic human values by Shalom H. Schwarz, and we analyzed current political messages focusing on the implicit and explicit values communicated by them (for example Viktor Orbán’s statements about the Hungarian nation, the Brexit-campaign and Apple advertisements). We also took a peek into some training and gamification methods. During the short introduction to drawing and illustration, we became convinced that all of us are able to express our thoughts and intentions in an aesthetic way if we don't give in to the inhibitions socialized into us from early on. We also tried the group discussions method called ‘Council’ and some elements of improvisation theater. Another inspiring method was shared storytelling, which was hard to begin, but later we did manage to synchronize our feelings, knowledge and inspiration, and we created good stories together. We also received information about the history of games, the mechanics of game development and the meaning of gamification. For me, the most useful experience was when we took a short walking trip in the vicinity of Sermugnano and simultaneously experienced the heros’ journey - the background story to almost any game or story. The theory about the hero’s journey originates with anthropologist Joseph Campbell, who studied stories and myths from around the world and created a nearly universal model to describe the development and motivation of characters. In fact, many games are built according to this logic and aim to find the perfect balance and combination of the milestones of challenge, extrenal support, failure, learning and success, which can result in both a great game and learning experience. We dedicated a whole session to video games: we discussed their pros and cons and spoke about their hidden potential. As this topic is very far away from me in all senses of the word, I could not participate in this discussion. But I definitely learnt that I should and could not neglect the fact that if millions of people spend their time playing with video games, which often transfer violent and negative values, then it is a field that should be recolaimed and used for our own pedagogical goals. In all, the War Games training was very useful and rich in experience, and I'm sure that it will have a long-term effect on my work in the School of Public Life. The most important lesson for me was that gamification does not mean simply using games during our trainings, but a lot more: it means adopting the theories of game design in an area outside of games - for example in public transportation, museums or teaching. If we want to use the learning and growing potential of gaming, it is not enough to use some gaming elements, but we have to build activities and processes consciously by using the heroes’ journey and other essential elements of game design. Tessza Udvarhelyi: How to use research for activism? Thank you very much for this opportunity – it is such an honor to be here for both of us. in the next few minutes we will share some of our personal stories and experiences of how research changed our lives and led us to become activists. For months, my co-researcher and I had been looking for a topic that would meet these two criteria. Then in 2002 we found a short article in a newspaper that reported on a new program launched by the mayor of Budapest to clean (and this is the word they used) the underground pedestrian passages of Budapest from 3 things: graffiti, illegal vendors and homeless people. So we dug into this topic and stuck with it for three years. Over these years, I got more and more angry at what I discovered. In the interviews we made and the texts we read, the politicians and technocrats of Budapest kept trying to convince me that they were doing what all the so-called decent residents of the city wanted: clean the city of undesirables and give it back to us, decent people. In other words, as it turned out, homeless people were chased away in my name and to serve my imagined needs as a white middle-class resident. I come from a safe middle class background with many privileges. One of these is a secure home and the other is almost unlimited access to quality education. Even though I was vaguely aware of these, this research forced me to take a harder look at my own position in the world and the things I take for granted. It was definitely a process of awakening. More importantly, this research did something I never even knew was missing: it helped me discover my political self. It not only made me angry as an individual but also made me think about my role in reproducing injustice and about WHO was responsible for changing what I was angry about. After we completed the research, we started thinking about how to make it “useful for society” as we heard it so often in school. We contacted different NGOs, sent them our study and were really HOPING that they would use our findings. One of these organizations was Man on the Street, an activist network fighting for the right to housing. And this is where my life changed for good. This organization did not just thank us for our work, but invited us to join them. If you really want to do something about it, you need to take responsibility for it – this is basically what they told us. You can’t just HOPE that your academic work will be useful for someone somewhere but you actually have to TAKE ACTION to make this happen. You have to seek out opportunities, not just wait for them. You have to actively engage with civil society organizations and social movements if you REALLY want your work to be used. They will never come to you and ask you for your help – you have to go ahead and make sure the knowledge you produced is available to as many people as possible. And this part they did not teach me at the university. In the end, I did actually join this group and became an activist. For the first few months, I was telling myself that I was there out of a sense of duty: that I had to follow through with my research, making sure that the group understood what we found and knew how to use it for their own purposes. And then another important thing happened. In 2005 the Budapest general assembly proposed a law that would ban begging in all the public spaces if Budapest. At first the group was not sure whether they wanted to step up against this proposal. However, as this was one of the topics that we covered extensively in our thesis, I showed them historical and international examples of how the criminalization of begging is nothing else than the criminalization of poverty. It took some convincing, but we finally did decide to organize against it and I found myself as one of the organizers of a protest in front of the city hall as the voting took place. We actually won and the ban was not passed. The next day I was travelling by tram and as I was thinking about the protest, I suddenly had this very strong sense of power come all over me. It was a feeling that I never had before and will never forget. I know this sounds a bit cheesy, but this was the moment that I was actually born as a citizen. Now I know that before I was only the skeleton of a citizen. For the very first time in my life, I had actually managed to intervene into the life of a larger collective, the society I was living in and this was both necessary and liberating. Since this moment, I have been an activist for housing rights. 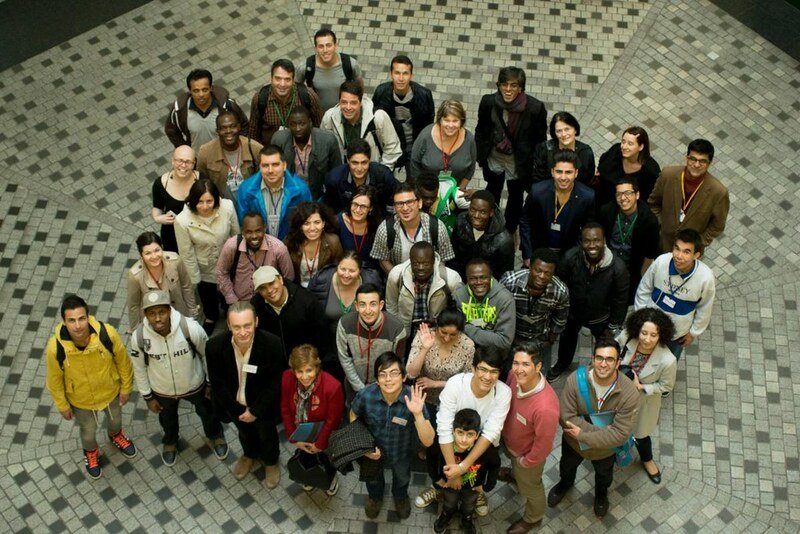 In 2009, I co-founded The City is for All, the only grassroots housing advocacy group in Hungary. A unique feature of this group is that its membership includes homeless, formerly homeless people and middle class allies such as myself. For nine years now, we have worked together, sharing our skills, knowledge and experiences to achieve housing rights for everyone in Hungary. So it was through research that I found my citizenship, but only by consciously going beyond the academic realm and making a personal effort at achieving change. HOPE was not enough. It was through action that I was able to take responsibility for change. Later, I realized that if research was something that could politicize and liberate me, it can have the same effect on other people, too, especially those who suffer from the most serious forms of oppression and exclusion. However, in the traditional university setup, these are exactly the people who are not present – or if they are, they are always the objects of research. Their ideas and needs are always being studied by other people, which definitely does not lead to their liberation – but often to further stigmatization. 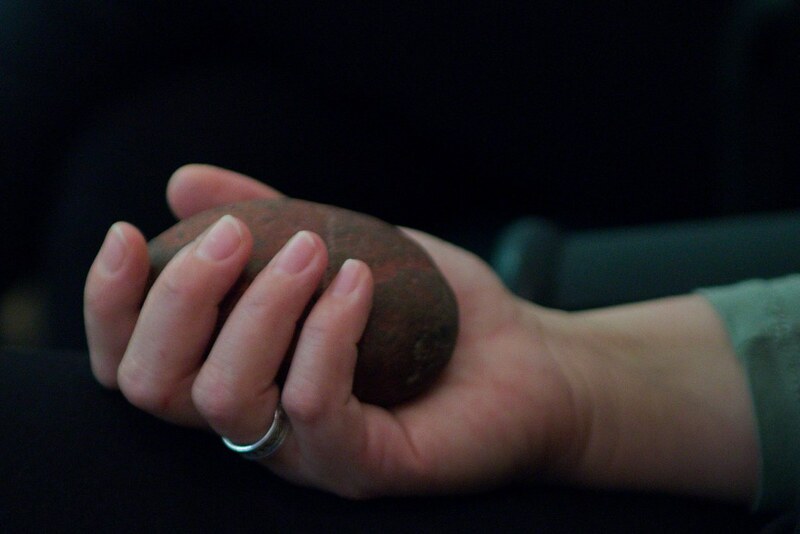 As I was struggling with these issues, I was lucky to discover the world of participatory action research as an approach where people who are affected by a social issue are not studied as in a laboratory but actively engage in research themselves to understand the structural roots of their problems and then take action to change the situation. In this case, research goes way beyond the walls of the university and becomes a path towards full citizenship – something that is essential for oppressed groups to challenge their oppression. In the School of Public Life, a community-based education center, where I work today, we believe – as one of our participants put it – that democracy is not a noun but a verb – it only exists if we do it. We offer courses, workshops and open forums where people can learn about social and political inequalities and develop their skills in both the everyday representation of their interests and more large-scale advocacy and movement building. Many of our students come from socially disadvantaged backgrounds, but we also have many middle-class people who are interested in becoming activists or simply active citizens. In the School we see participatory action research or PAR as a form of critical pedagogy. 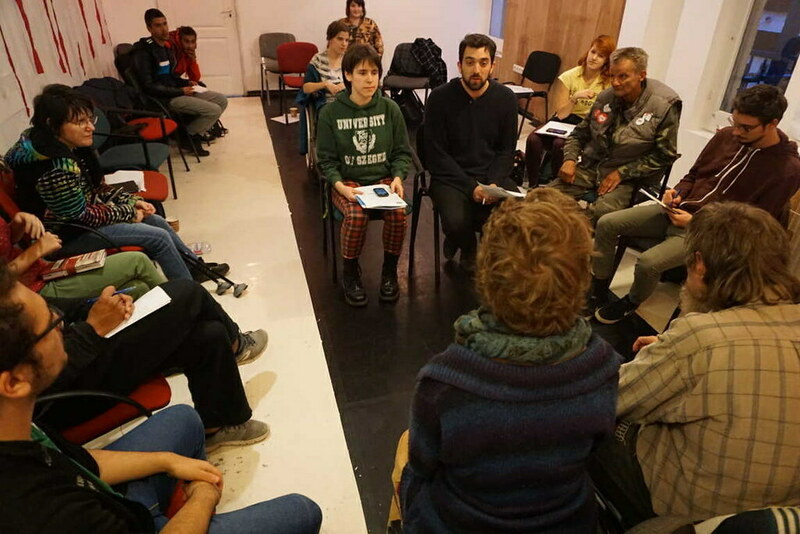 PAR is a long-term form of political education where people explore the conditions around them, connect the dots, draw the conclusions and also think about ways to take action. And in this process, they go through the same process of becoming a citizen as I did back in 2005. In our participatory action research projects people with no academic background and often little formal education who were the victims of different kinds of social oppression discovered their own citizenship and responsibility by asking questions, collecting data, formulating answers and planning actions. In the PAR projects I have been involved in, we have explored the various forms of discrimination homeless people face in public spaces, uncovered the history of housing movements in Budapest and studied the conditions of independent living for people with physical disabilities – all with the people who are directly affected by these issues. I have learnt a lot during these projects – not only from what we discovered, but also – and mostly – from my co-researchers. I personally don’t believe in individual research anymore. I believe in collective, participatory research where knowledge is not produced for the sake of abstract academic ideals or professional career building, but is shared broadly and is a means to empowering people to become fully fledged political beings in the world. In other words, I believe in research that produces citizens, who take responsibility for change. And I believe universities have a central role in understanding, embracing and promoting research of this kind. Of course, I don’t believe that everyone should be an activist or that participatory research is the only valuable approach to the production of knowledge. I believe that there are many ways for s to take responsibility for change. What I do believe though, is that universities and other academic spaces have to be places where these questions are not only addressed as abstract topics or even worse, as niceties, but as key political questions that everyone has to find their own answers to. In a world where masses of people are deemed politically, economically and socially useless, the university and the intellectuals it socializes have to take a leading role in helping all of us discover the real meaning of our citizenship and challenge the political, social and economic conditions that dehumanize all of us. Zóra Molnár: How to use research for activism? Thank you for giving me the opportunity to share my experience with our participatory action research today! I would like to tell you why the participatory action research has played a crucial role in my life; how our group started to focus on advocacy, and finally, I will tell you some key moments of our biggest success story so far. When I started the university in 2009, I moved to Pécs and spent the upcoming three years in a dormitory. After finishing my bachelor degree there in 2012, I decided to come to Budapest and continue my studies here. Initially, I thought it would be easy to manage this process because I had already done it in a smaller city three years. I contacted each university which offers a masters program in psychology to find out if they are wheelchair-accessible or not. Finally, I ended up with scheduling a visit to the Eötvös Lóránd University to attend the open house, meet the coordinator of the students with special needs, and to see the dormitory where I could live. A few months later it turned out that due to the fire and safety regulations it is not possible to create an accessible room as we agreed earlier. The university offered me to options: either I could move to the institution of people with physical disability at Marczibányi square and live there for two years or postpone my studies with one year, stay at home and see what the future brings. I had never lived in an institution before, and I knew that as long as I have an influence on my own life, I will never do so. Staying at home was not a real alternative either, because my family lives in a small village with bad accessibility conditions and very few opportunities for an independent life in general. We started to look for backup options because the academic year had begun in September, and in the mid-summer, I was still in need of a place to stay in Budapest. Although we left no stone unturned, it appeared to be impossible to find accommodation for a student in a wheelchair. Those universities which had proper rooms were insisted on keeping them for their own students, not to mention the sublets where there can be found basically no examples of wheelchair-accessible properties. Finally, I managed to move into a social housing unit and start my studies on time, but it was a matter of fortune rather than a systematic response to my problem. From this point on I knew that I want to do something about this situation. I thought it is simply cannot be allowed that talented young people are excluded from the highest quality educational institutions just because there are no proper housing services available for them in Budapest. It is simply cannot be allowed that the lack of adequate housing opportunities prevents young adults with physical disabilities from becoming independent from their families and starting their own lives. I had no doubt that this is nonsense but did not see the way how to change it. Joining the ”Living Independently in a Community” group was a life-changing experience for me. Although I had no idea about the participatory action research when I went to the kick-off training in August 2016, it became clear slowly, that it might be the tool for that I had been looking for so long. 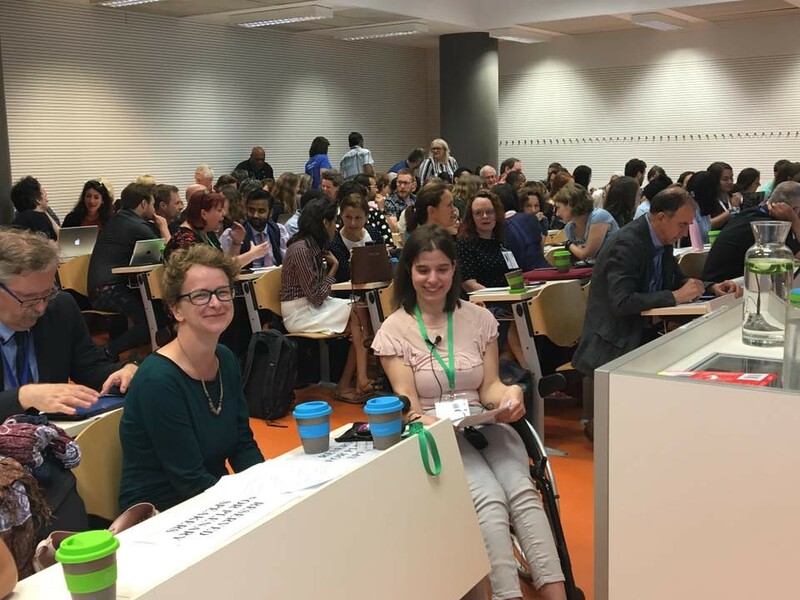 Our group was made up of 14 members: 10 researchers with physical disabilities three allies (social scientists and social professionals) and one photographer. We got to know each other and got familiar with the main types of the research methods during the introductory training. Afterward, we started to work on defining our ”the big question” which we had tried to answer in the upcoming ten months. Following several weeks of brainstorming in common, we decided to dedicate our research to the question: ” what are the conditions of the independent living for people with physical disabilities in Hungary?” Considering that this is an extraordinarily complex topic, we decided to narrow down our research to the following five main areas: housing policy, accessible public transportation and built environment, supporting services, income and social attitude towards people with physical disabilities. We used a wide range of research methods to explore these areas. We designed and conducted two online surveys (one for people with physical disabilities and another for careworkers. We were interviewing people with physical disabilities (focusing on their housing circumstances) and also professionals. At last but not least, we also used public data several times. Although our topic was very complex, we had been paying special attention to two topics during the entire process. The public transportation was our first focus area: we organized two roundtable discussions on the problems and potential solutions related to the public transportation in Budapest. On the other hand, we also put a big emphasis on dealing with housing policies. We also had some guest speakers, one of whom was a lawyer specialized in the system of the so-called ”supported housing.” This form of housing is supposed to replace the large institutions, which have to be closed down. However, it became clear for us, that the current system serves the interest of those who maintain these „mini institutions” rather than offering a real opportunity for independent living those in need. Thanks to our research, we have gained a huge amount of lexical knowledge, but I think it is even more important that we have become much more confident, have got interested in the public life, and our political awareness has started to develop as well. I do believe that this set of skills made us self-advocates who are not only determined but also conscious. In last spring we already knew that we would like to continue working together when the research comes to its end. At that time, we had come across the open call of the Civil College Foundation which was targeted at local communities with some experience in advocacy. We thought it was an amazing opportunity to increase our group and prove its subsistence on the long run, so we applied, and after completing all the requirements successfully, we won enough money to employ a professional community organizer who also receives mentorship and professional training in the frame of the program. We opened up the group to the newcomers in last October, since then we have been functioning as the first ever advocacy group of Hungary which tackles the issue of independent housing for people with physical disabilities. Our goal is to introduce a legal reform in the field of the supported housing by making the system more responsive to the individual needs and demands of those who are affected. Besides fulfilling a pivotal role in housing advocacy for people with physical disabilities, we have been continuing our activities concerning the accessible public transportation as well. The issue of the reconstruction of the metro line 3 served for us like a hot topic last year. Especially after the major of Budapest had made a statement, saying that it is not worth investing in making the metro accessible because the people with physical disabilities do not use it anyway. Apparently, we found this way of thinking unacceptable, felt outraged and wanted to raise our voice to point out the nonsense and reversed logic behind this approach. We organized two street actions at the „Dózsa György úti metro station,” the only station in the first phase of the reconstruction which was not supposed to be made accessible according to the original plans. We held our first event at the end of October last year; we took some wheelchairs to the underpass and asked the passers-by to sit in and try to use the ramp. It turned out very soon that the slope is way too steep to cope with on their own. They could also attempt to overcome the stairs with the help of some funny tools (e.g., balloons). Our second action took place on 3rd November 2017, the day of the closure of the northern section of the metro line. 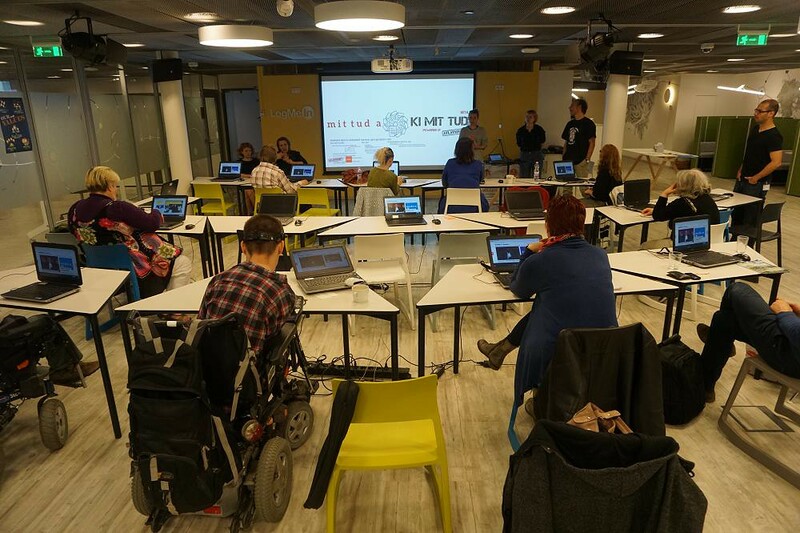 It centered upon an open discussion on the importance of accessibility and solidarity. In the meantime, we were attending several meetings with various actors involved in the issue, among others the Metro Project Directorate, the National Federation of Disabled Persons’ Associations (MEOSZ) and the Association of Disabled Persons in Budapest. In spite of the demonstrations organized by various organizations and the increasing media attention, neither the government nor the major of Budapest wanted to take the financial responsibility for the costs related to accessibility. In December 2017, an opposition party politician submitted a referendum question on the full accessibility of the metro line. The collection of the signatures could be started finally at the beginning of February. A few days later, the president of MEOSZ suddenly managed to make progress with decision-makers, and after a series of negotiations with István Tarlós, they agreed on examining station by station what the technical possibilities are to make them accessible. At the end of April, they signed the agreement on making all the 20 stations accessible. This decision has been undoubtedly the greatest success story of the Hungarian civil sector for a very long time. Our group is proud of its contribution to this great achievement, and it inspires us to continue our struggle in other fields as well. I am grateful to the School of Public Life for being able to participate in the “Who cares about elections?” workshop. I left the room as a conscious voter at the end of the three-day workshop. It helped me become not only a more effective member of the civil society organization I am volunteering at, but also a better citizen. The workshop equipped me to be able to ground my reasoning on hard facts and real life examples in the upcoming election period. Hopefully, I will pass on what I have learnt this weekend convincingly wherever I can. It was also a great experience to meet the other participants, get to know their issues, and share our knowledge. 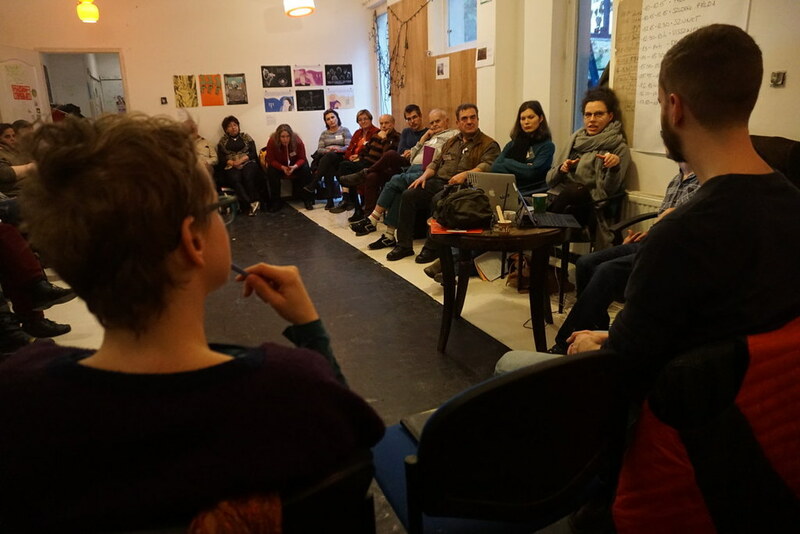 It is a very valuable aspect of the workshop that people from outside Budapest also participated in it, together with participants from Budapest who are not part of the usual NGO and activist circles. The workshop provided participating organizations an opportunity to develop their network, learn about the working methods of other organizations, and develop the programs of our own organization through some specific, practical exercises. The expertise of the facilitators made a very difficult and broad topic accessible and digestible. There was no idle time or any futile moments in the course of the weekend. This year, I had another opportunity to participate in the Advocacy and Base-building training of the School of Public Life. Even though I had already participated in a similar training, I learned a lot from this workshop, too. The reasons for this are rooted partly in the essence of the training, and partly in the ever-changing nature of my community where I will apply what I have learned. This time I felt that the group organization exercises were the ones that would help me a lot later. It is part of the constantly renewing nature of the School’s trainings that different organizations are represented every time by different members. Therefore, each time a new community is formed, where you can meet new people while also see familiar faces. Besides, the training is very practice-oriented – we used real-life examples and shared our experiences – which makes it always very relevant. The methods and the training materials are also always updated, which is yet another proof of the facilitators’ professionalism. The atmosphere was very positive throughout, as an small community was formed out of the participants in these two days, and I am sure I will be able to use the knowledge I learned here when I get home. 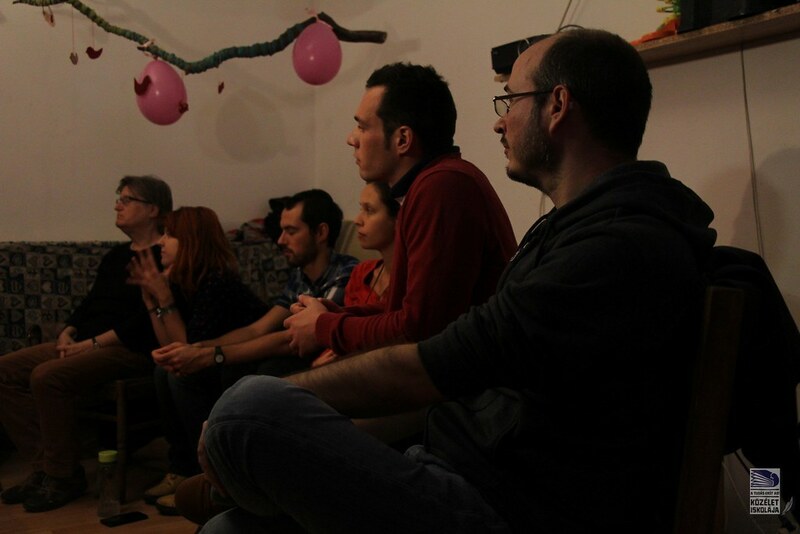 It is a curious story, how I found the autumn film club of the School of Public Life. Having lived abroad for many years with my partner, we decided to move home in summer. We had to re-discover Budapest and the intellectual spaces close to our worldview. Since we did not want to miss the smaller places that offer exciting programmes either, we found our way to Gólya Bistro, where we saw the flyer of the film club organized by the School of Public Life. During this 8-week program, different social problems and processes were introduced and the social and political answers given to them through the emergence and operation of various social movements. The topics covered included housing, environmental justice, and the situation of disabled people in the world. According to the program, each screening was followed by a discussion facilitated by Mariann Dósa from the School of Public Life. She has great theoretical and practical knowledge about social movements, therefore we always felt as if we were participating in a professional discussion. Besides, she encouraged us to think about and discuss what we saw. I think it is crucial to improve critical thinking and the culture of deliberation in Hungary. Today, extremely simplified and often victim-blaming messages dominate the public sphere, therefore it is very important to have organizations that promote a different approach and seek to the improve critical thinking and the exercising of democratic rights in Hungary. The film club was an excellent instrument for this and I hope that it will eventually be continued. Personally, in the future I would like to watch movies about and discuss the procedures that led to the development of the above-mentioned problems. 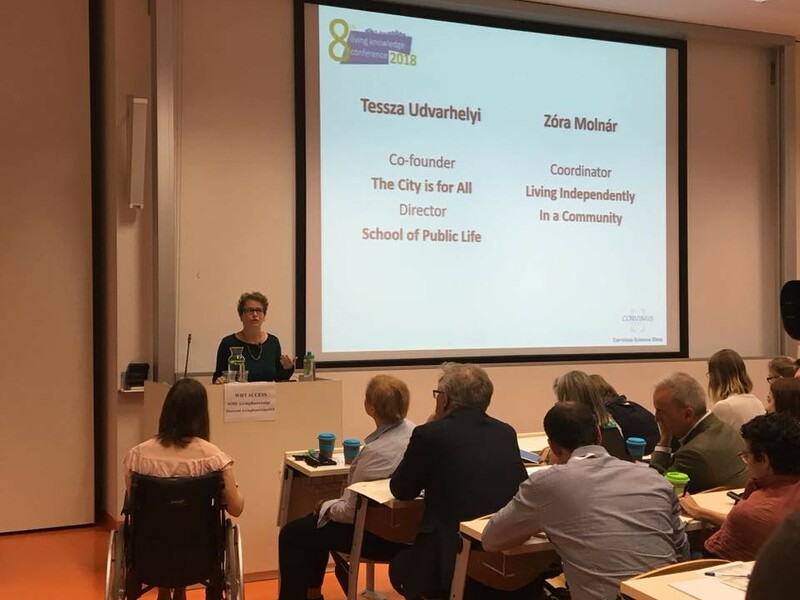 I am grateful for the School of Public Life for the organisation of the film club, the great discussions, and the important work they do in Hungarian public life! Lately, I’ve been feeling that the knowledge I had gained so far was not enough to realize all I had set as my goals. So I participated in a three-day practical training, organized by the School of Public Life, titled ‘We must communicate – but how?’. 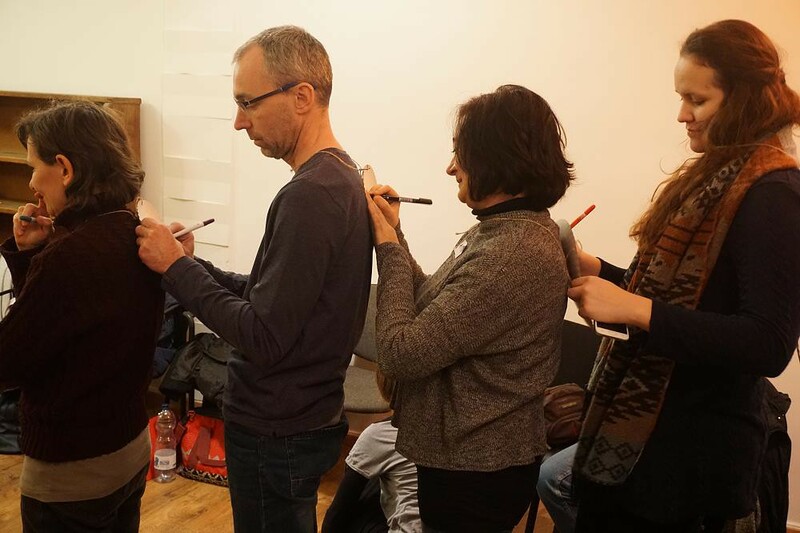 The training covered three topics, introduced by acknowledged trainers: first, we learned about nonviolent communication from Kriszta Hoffmann and Judit Wirth. Then we were acquainted with the tricks of facilitating discussions by Tessza Udvarhelyi and Panni Végh, and finally,Boróka Béni presented to us the restorative approach of conflict-resolution. To sum it up, I had a chance to learn about communication methods that help to tame conversations and create an atmosphere for decision-making in which everybody can open up and share its opinion with the others. I was also introduced to decision-making mechanisms that I had never encountered before. I could see how important a role the leader of the discussion plays in these situations - either as moderator, mediator, or facilitator. We gained practical knowledge through the trainers, who are credible representatives of the topics they covered. Situational games became comic when we recognized the characters from our own private lives, and we could get a perspective on our own ways of working. The participants came from different backgrounds, with different values and personalities, but these differences did not cause any conflicts, because we could develop in an atmosphere of democracy, acceptance, and respect thanks to the organizers’ professionalism. In this atmosphere, I could make new observations about myself and I recognized how I should communicate in order to be an active participant of the world around me, and be able to support others to do the same. I would NOT recommend the training for those, who are planning to withdraw from the world and become a hermit, but for everybody else I would strongly advise it! I was glad to hear about the training in data request, because we had already started requesting public data from maternity hospitals in KANGA Association when we heard there was a training about this. In the training, we learned how to use the Kimittud interface that is fully transparent, therefore our requests and the responses are accessible to everyone, and besides, due to the legal references provided by the interface, the institutions take it more seriously if we request data through it. Before the training, 17 maternity hospitals responded to our request, and since then 73% answered us. I am especially proud of the fact that every home birth institution responded to us, as well as Róbert Károly private hospital that is not even obliged by law to provide data. We are currently working on making commenting possible on our website in addition to our Facebook page. And since this initiative is voluntary, community donations are very welcome, so that the database stays available for everybody in the future, too. I am very grateful for the chance that I could take part in this effective and useful training! In 2017, we had two types of trainings in the refugee education program of Central European University (OLIve: Open Learning Initiative). The participants of these trainings are refugees and asylum seekers, who wish to pursue education on the MA level, but to do so, they need to improve their English and their knowledge in the subject they want to study. OLIve has an advocacy module that reflects the commitment of the organizers to the idea that theoretical knowledge is not enough for one to be able to live a life as an active citizen – it always has to be complemented with practical knowledge about social-political participation and representation. With this in mind, in three terms of the 2017/2018 academic year, we cooperated with Menedék Association in holding 12 workshops for OLIve students. We used interactive educational methods in the training and, building on students’ personal experiences, we covered topics such as forms of political participation, mapping power relations, social movements and key ingredients of their success, citizen journalism, community-based and participatory action research, and the responsibilities of intellectuals. By the end of the academic year, students will plan and carry out their own advocacy projects individually or in small groups. The second type of training that we are holding in cooperation with OLIve is individual tutoring in Public Policy of a refugee student from Afghanistan, who would like to study this field after the training year. We are glad to be able to take part in this program, and hope that our cooperation with OLIve will be long-lasting.